In a beautiful town park with water in play on many holes. Red practice basket has a concrete tee and serves as a warm-up hole. A number of holes have 3 sets of tees (blue and orange pavers mark alt. tee positions). From Main Street in Sellersville; go east on Walnut St. (town clock). At 1st stop sign turn right into alley across street from large grey estate. 1st tee near the Scout Cabin Lot. If you wish, you can continue on Walnut to the Lake Lenape parking lot on right and start at tee #7. 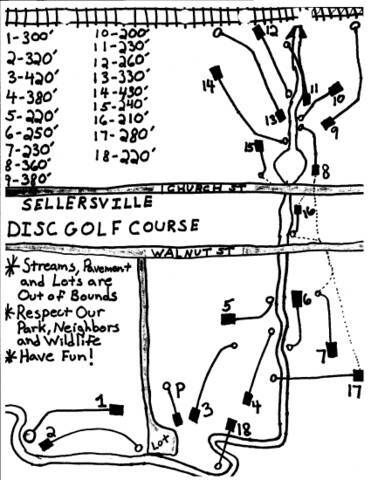 Have you played at Sellersville Disc Golf Course? Be the first person to review this course!